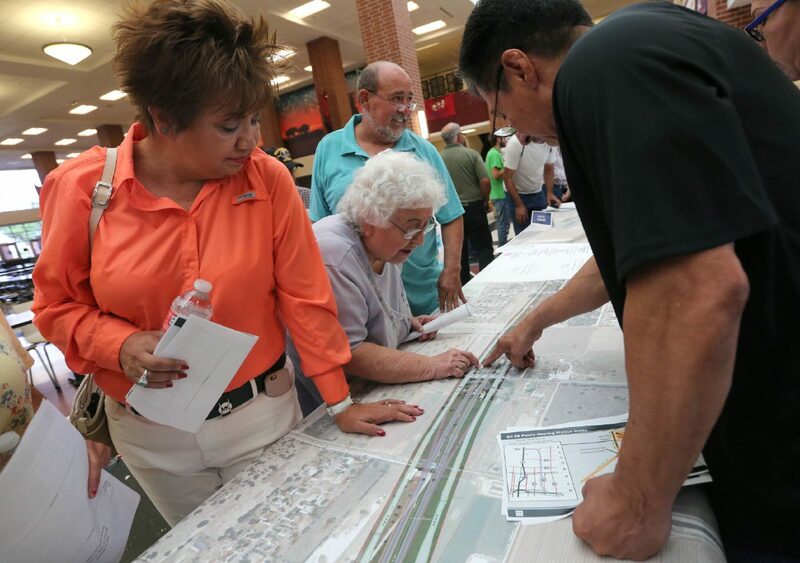 People look over a section of the proposed route for State Highway 68 before a public hearing on the highway Thursday, April 5, 2018, at Donna North High School. 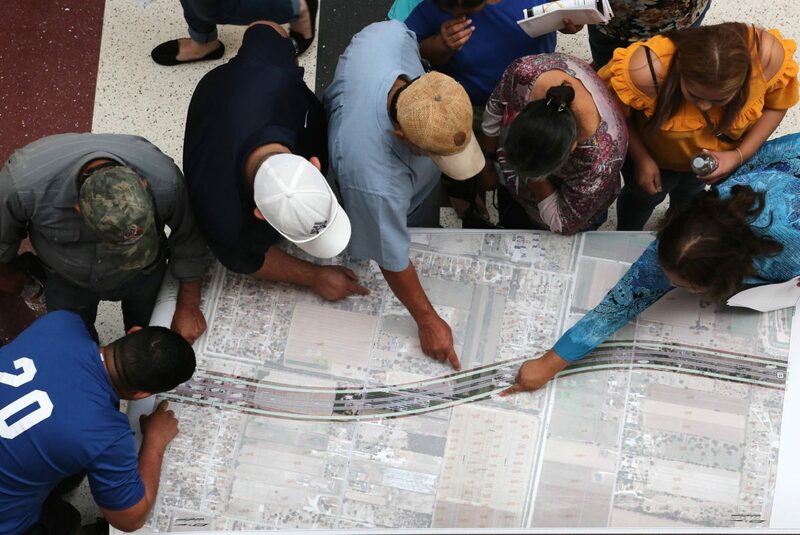 DONNA — Domingo Lara, a retired oil-field worker, re-examined maps Thursday evening of the proposed State Highway 68 that would slash through his five-acre ranch where he lives with his family in rural Edinburg. The Texas Department of Transportation held a required public hearing at Donna North High School where the maps and the draft environmental impact statement were available for review. 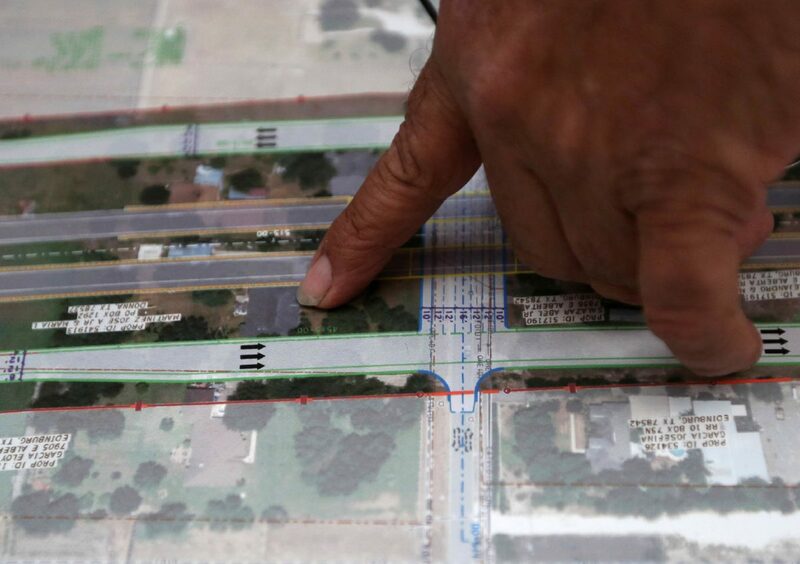 The map confirmed that Lara, an Army Veteran, and his wife along with their three adult children might have to give up their land so TxDOT can construct a four-lane highway and frontage roads connecting U.S. Highway 281 in Edinburg to Interstate 2 in Donna. When Lara was 25 years old, he bought the property for $17,500 after seeing it advertised in a local newspaper. Now, at age 51, he’s preparing for the government to purchase a little more than half of his land to build the proposed highway. 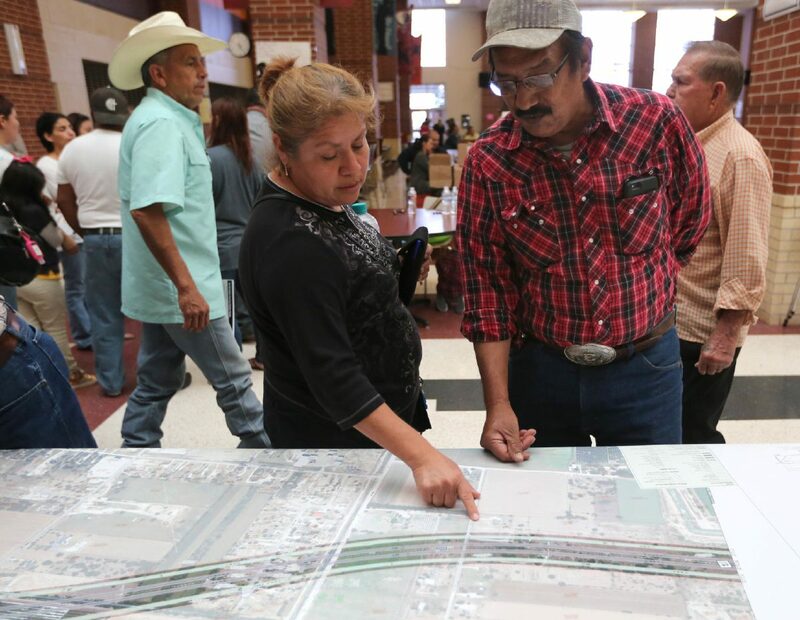 Maria Tovar, left, looks at a portion of proposed State Highway 68 that will go over her home before a public hearing on the highway Thursday, April 5, 2018, at Donna North High School. Tovar said she has lived in her home for nearly 25 years. The 21.7-mile highway would cost an estimated $768 million and effect 102 homes currently built in its path. Joe Martinez points to a satellite photo of the roof of his house with the proposed route for State Highway 68 going through it before a public hearing on the highway Thursday, April 5, 2018, at Donna North High School. Juan de Leon, Jr. asks talks to members of the Texas Department of Transportation about the proposed State Highway 68 during a public hearing on the highway Thursday, April 5, 2018, at Donna North High School. De Leon was against the project. Yolanda Lara, left, and Efrain Castillo look over a section of the proposed route for State Highway 68 that runs through their neighborhood before a public hearing on the highway Thursday, April 5, 2018, at Donna North High School. “You wouldn’t think anything would be going by there except farm tractors and a couple of stray animals,” Lara said. His 18-year-old son and two daughters in their 20s live on the property with their mother who works as a provider. His daughter, Joanna Lara, said she doesn’t mind seeing a highway go up through their land. A TxDOT official at the hearing highlighted the projected population boost and increase in traffic in Hidalgo County during the presentation. “Anybody that drives on the expressway and has been driving in the Rio Grande Valley a majority of their lives, can see the huge difference in traffic,” said TxDOT spokesman Octavio Saenz following the hearing. 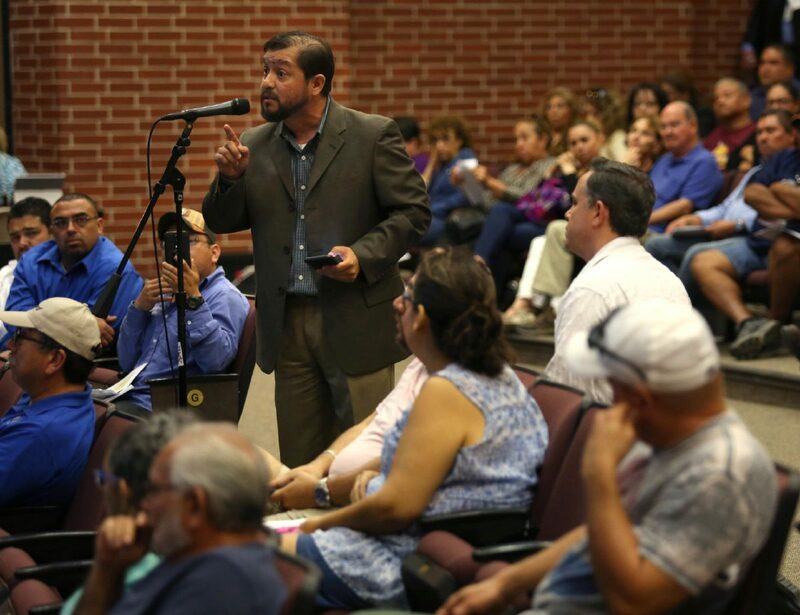 The presentation by transportation department officials and Rudy Rivera, an engineering consultant, was followed by comments from the public — most of which were against its construction. For Lara, though, reality already set in. He doesn’t plan on attempting to keep his land. Rachael Villarreal, a member of the Fike family who owns a farm in San Carlos, spoke adamantly against the construction of the highway during the public hearing. The proposed highway could cut through not only her home but the home of her parents. “That’s pretty hard for one family to endure, including the fact that our farm is on one side of the highway and our land will be on the other side of the highway,” she said. Bill Lang, a Winter Texan who currently lives in Alamo, spoke in favor of construction. “There’s a lot of backup of traffic during rush hours, and therefore I believe State Highway 68 needs to be implemented to alleviate a lot of this congestion,” he said. TxDOT officials will now review the comments received before a final environmental impact statement is released. TxDOT will then provide a “record of decision” — the official document that will disclose whether the highway will be constructed. So far, funding has been allocated for the frontage roads portion of the project from Interstate 2 to Monte Cristo Road. Money has not been appropriated for the second phase of the project from Monte Cristo Road to U.S. 281 or for the main lanes. Concern from some residents surrounded what they said is the possibility of the main lanes being constructed as a tollway. So far, $55 million have been allocated to fund the highway project, according to Saenz. TxDOT officials expect to release the final decision in spring 2019, and written comments will be accepted until May 15. Construction could begin in 2022.